Every menu on the Central Coast has a burger on it. It is something I have learned to accept in dining along the coast. Burgers are popular, no doubt, and a welcome menu item and ubiquitous with American dining culture. 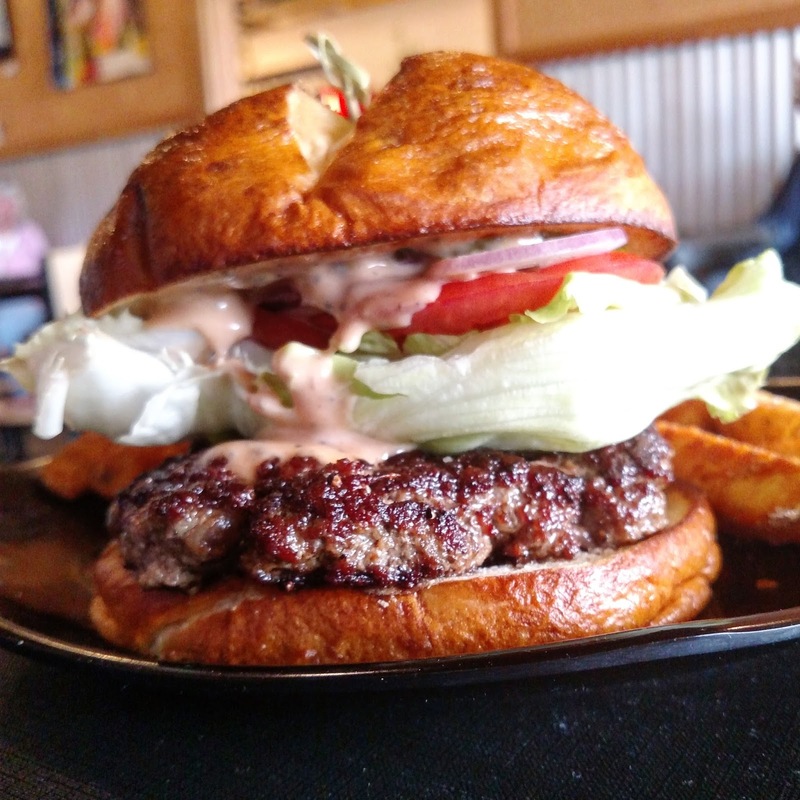 There are probably 300 burgers within 10 miles of where I stand and yes, I could easily list off all the safe mainstream burger options, but in true Soifeats fashion, I want to give you MORE of what’s good, to search for above-average food in interesting locations you may have overlooked. Here are 5 standouts you HAVE to find. BEACH BURGER Oceano — Starting off in the South and not *intending* to grant any sort of order, but this little place definitely blew me away on several levels and falls into as close to a NUMBER ONE on this list as can be imagined. First of all, the location is not ideal for local foodies. But once you get over that, everything else falls wonderfully into place. A completely new find–something I had never even HEARD of until suggested–I had to Google it, and BAM! there it is, right on the sand-swept avenue encroaching on the dunes. Tiny and unassuming, the bright plywood exterior barely hints at the incredible food inside. I pried a bit into the methods of the kitchen and one astonishing fact after another flowed forth: Basically everything is from scratch. No, SERIOUSLY! They dry their own onions and herbs and grind them. They make their own pickles. It goes on and on. I lost count of everything they make by hand in the kitchen every day. This looks like the kind of place a SYSCO truck would back up to every morning and have laminated menus. But NO! Exactly the opposite. More attention to detail of ingredient could hardly be imagined. And the burgers, OMG. Everything is technically a cheeseburger, as they mold grated cheddar INTO the actual patty–a patty they blend and make by hand every day. 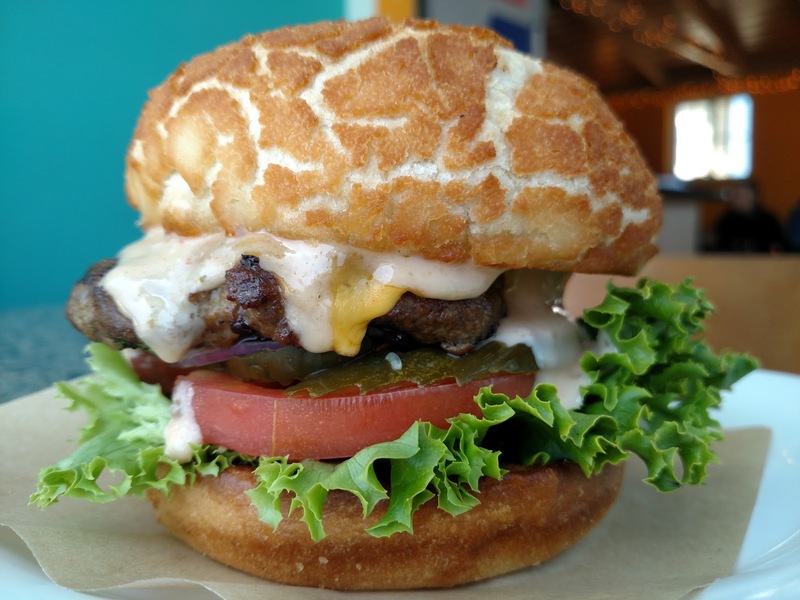 Burgers come on Dutch Crunch rolls–this is a strict NO SESAME bun establishment. A restaurant all locals should put on their list to visit. I had no idea it was there, but boy am I glad I found it. BROOKS BURGERS Pismo Beach — Brand new and in a classic location, this local family of cattle ranchers decided they wanted to serve their food to the community, and the community is better off for this addition, believe me. Been watching the build-out on this formerly boring Mexican eatery with eager anticipation and they have definitely added a bright spot to the local dining culture. Juicy, perfectly-cooked burgers with a good array of sides, these run-down-your-arms-drip-off-your-elbows offerings reflect a commitment to quality and classic burger goodness. Attentive service and food with nary a complaint. A definite Top-5 establishment. WOODSTONE MARKETPLACE Avila Beach — A hidden gem locals and tourists alike flock to, I have been taking my family to Woodstone for EVER. Here I am going to sway slightly from the burger-norm and suggest the Vege-burger! I’m not even an vegetarian, but find myself ordering the Garden Burger at Woodstone over and over. Lovely patty of seeds and carrots, topped with gobs of veggies and on a perfect bun, it is easily one of my favorite sandwiches at local restaurants. 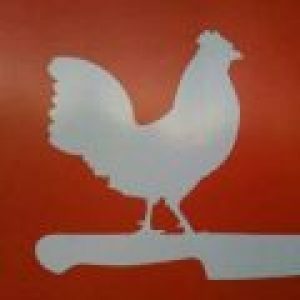 Great wine list, familiar service, and one of the best settings for dining on the Central Coast, a PERFECT stop for gearing up for a walk or ride on the Bob Jones Trail to Avila. FLAVOR FACTORY Morro Bay — A highly acclaimed spot opened by the former owners of the iconic TACO TEMPLE, this is one all eyes are upon. And they are doing everything right. THIS is a ridiculously good burger. Probably one of the most *home-style* burgers I have had. 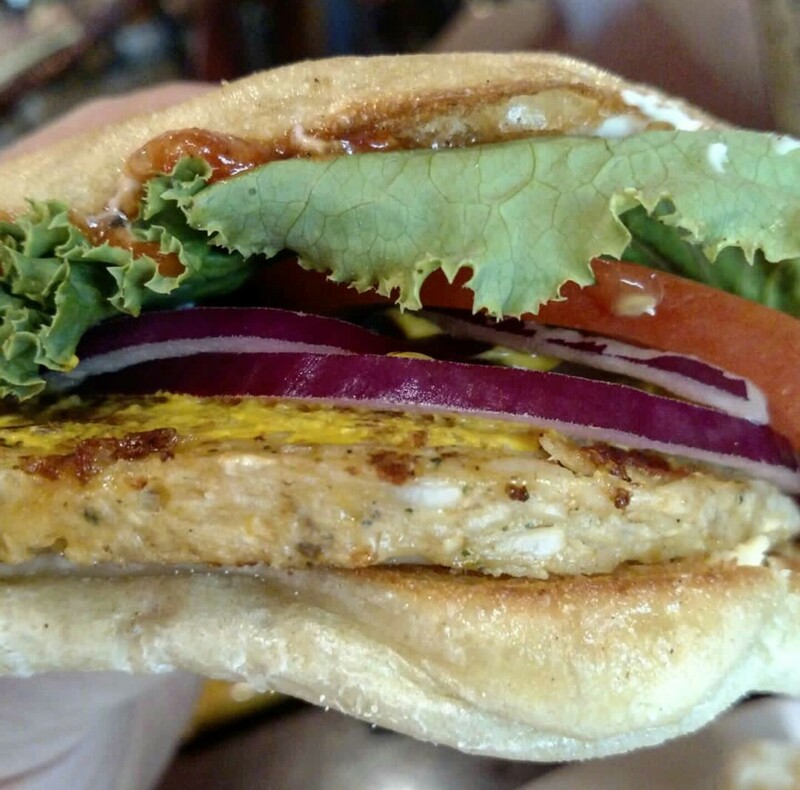 Patty tastes like it just came off a neighbor’s grill. The meat is phenomenal, perfectly seasoned and cooked and served in a way NO burger aficionado could argue with. A near PERFECT burger, and one EVERYONE should experience. Grab some extra napkins. 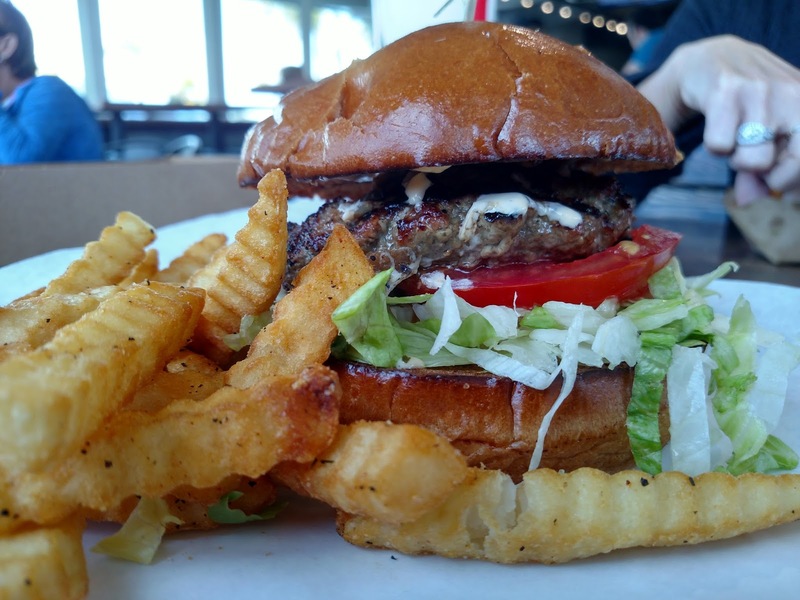 THOMAS HILL ORGANICS Paso Robles — I’m going to switch up this list once again, this time with a burger which not only is vegetarian, but also doesn’t even have a PATTY! 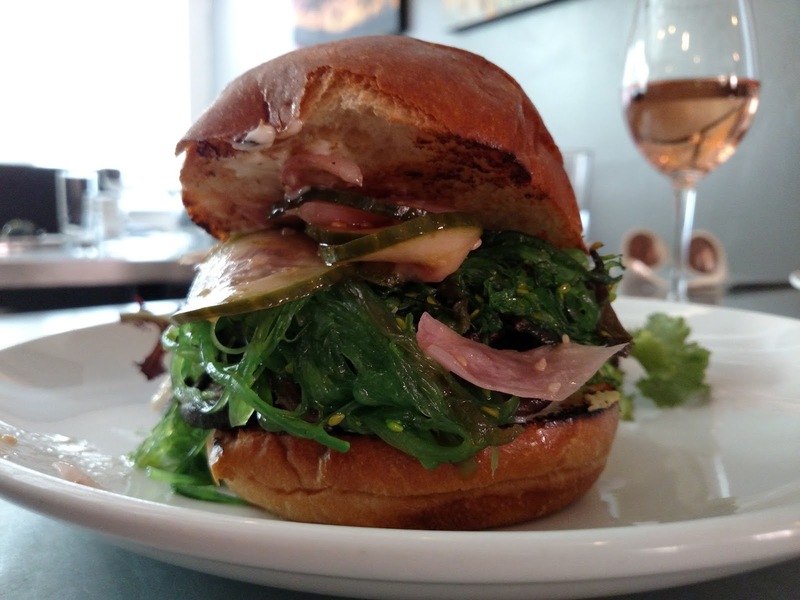 Served on brioche, packed with avocado and house pickles, the *patty* is a fat wad of seaweed salad! Shoot, this burger is probably even VEGAN! It all works perfectly, and of course it is Thomas Hill Organics, with a spectacular winelist and incredible service in the heart of Paso Robles. I’m always looking for options for dining with my vegetarian and vegan friends, and THO knocks it outa the park with this combination which only looks crazy until you take your first bite. So what’s stopping you from getting a burger?